Lofts are often unique and intriguing and we have some pretty cool ones in Toronto. They definitely cater to a certain type of urban professional and are usually in high demand. But not all lofts are made the same. What sets them apart? 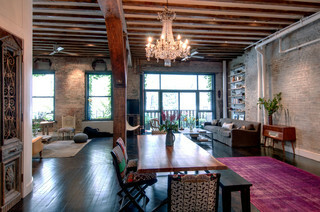 Lets start with a soft loft versus a hard loft to further understand these quirky properties. The word loft comes from Old Norse, and means “an upper room or floor: attic, air, sky.” Fast-forward to the present, and a loft is a place with high ceilings, open space, exposed brick, wood beams, plumbing, and ductwork and concrete or unfinished floors. With the popularity of lofts, in general, developers have seen an opportunity and capitalized on it. A soft loft is a space in a new building with the characteristics of a hard loft such as high ceilings, floor-to-ceiling windows, exposed concrete–either on the floor or ceiling–some exposed duct work or plumbing, and an open concept. They can either be 2 storey or all on one level. What they really resemble is a brand new condominium and lacks some of the character of a hard loft. They are usually located in highly desirable areas and have a balcony. The buildings themselves will look like your typical condominium structure and will usually have amenities, such as a pool or gym to offer their residents. Soft lofts are a great alternative for a buyer who is looking for something newer with some character, but with the conveniences of a traditional condominium. A hard loft is a conversion of a factory, warehouse, or church into a living or working space. The term “hard” denotes a space that is rugged with exposed plumbing, electrical, duct work, brick, and wood posts; these authentic details are a must. A “true” hard loft has one big open space for living and working with just a bathroom and kitchen, but now we see loft conversions with dedicated bedrooms and multiple levels. There are so many interesting loft conversions around the city and most buildings have unique floor plans, meaning that no two units are ever alike. Because of the exclusivity of hard lofts, they’re coveted among buyers. The locations of these structures are usually off the beaten path and rarely come up for sale. The buildings are smaller than a typical condominium, and units don’t usually have their own balcony, but the building may have a rooftop patio. You’ll be lucky to find a hard loft with any sort of amenities, so make sure to do your homework first. Regardless of which loft you end up buying, ensure it fits your lifestyle and has the elements you’re searching for, so you can truly enjoy the space. I personally love a good loft conversion, but what do you prefer?